LittleFin’s Chronicle has a stripped-down feature set compared to the kitchen sinks of many other applications, but it focuses on the essential—paying bills and tracking them. 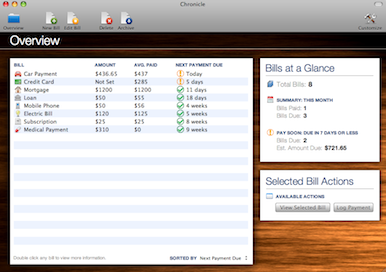 Enter your bills into the application’s simple interface, then display those bills as a list in the overview screen. A helpful (or stress-inducing) sidebar tells you how much is due is the upcoming month and next seven days. Chronicle looks like it was accidentally left out of Apple’s iWork, with a default woodgrain background and, dare I say, friendly spacious windows displayed much more decoratively than in most finance software. Chronicle integrates with iCal to handle reminders, meaning that you don’t have to check two calendars to know when the bells are tolling. Chronicle costs $21 and requires Leopard or Snow Leopard. A 30-day free trial is available for download.